Planning commission, on 4-3 vote, includes study requirement in updated transportation plan recommended to Washington County commissioners. The stage has been set for a renewed public debate about the long-dormant concept of new limited-access highways through Washington County, known as the "westside bypass." The county Planning Commission, on a 4-3 vote, added the concept for discussion in what was billed as an otherwise routine update of the county's transportation system plan. The plan, mostly recently updated in November 2015, outlines policies and specifies improvements. The Washington County Board of Commissioners has set a first reading of the changes for Aug. 21. The board usually hears public testimony at a second reading, which is two weeks later. While the official planning commission action didn't specify alignments to be studied, members referred to the Washington County Transportation Futures Study, funded by a $1.5 million state grant and completed 18 months ago. That study envisioned what the county's transportation needs might look like in 2060. The study suggested further consideration of two routes. One known as the northern connector would link the Sunset Highway (U.S. 26), which skirts the northern parts of Hillsboro and Beaverton, with U.S. 30 to bypass central Portland. The other route would link the Sunset Highway at Hillsboro with Interstate 5 to the south. Though the study omits detailed estimates, it projected that additional highway and public transit capacity in the county might carry a price tag of $26 billion. The move to incorporate a more detailed study within the county plan was initiated by Rich Vial, the planning commission chairman. "Our principal arterials are inadequate to meet Washington County's needs," he said "We need to make sure as a policy that we give ourselves a clear path to transportation planning that includes those." As a Republican state representative from Scholls, Vial was the chief sponsor of 2017 legislation (House Bill 3231) that would have allowed cities and counties to enter into public-private partnerships for special districts to oversee limited-access roads. The bill got a hearing but did not advance. The planning commission heard Aug. 1 from four opponents, including County Commissioner Greg Malinowski, during a 90-minute discussion that focused on the bypass concept. They said the bypass issue should be separated from the plan. "One of my biggest concerns … is taking the rest of the items on the housekeeping list and making them hostage to what appears to be a fairly controversial issue," Malinowski said. "You should not light a fuse on something and then hand it to the county commission." He also said its inclusion, even as a discussion item, would divert attention and potential money from a big backlog of road and bridge improvements. "Putting aside money for this is just not going to help," he said. "If we stop working on some of these local fixes we've got to do on our roads that are jammed, that is a problem. We do have to get these other things done, too." 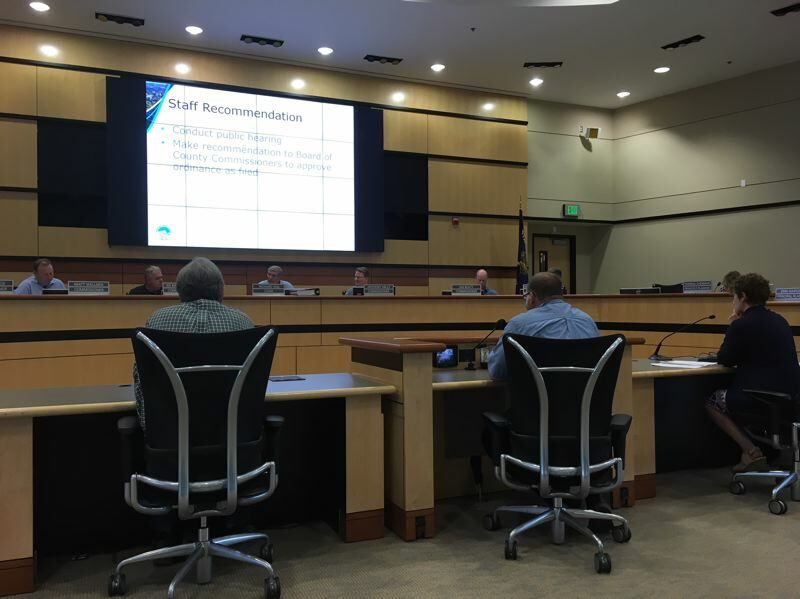 But Vial argued that its inclusion in the county's transportation system plan would send a stronger message to regional and state agencies — Metro, Oregon Department of Transportation and Oregon Land Conservation and Development Commission — that the county is serious about new north-south arterial routes. "This needs to be a conversation that is clearly driven by the political forces in Washington County," he said. If a majority of the five county commissioners support the planning commission, Vial added, "Then perhaps we would see a little different reaction to the conversation than what we see now." In addition to Malinowski, two others told the planning commission that consideration of new limited-access highways was unwise. "I agree with Chair Vial that we have a challenge," said Allen Amabisca, treasurer of the citizen group Save Helvetia, an unincorporated community that could be in the path of a bypass route. "But putting it into a publicized housekeeping ordinance, you are giving a very negative impression to the population." Meeky Blizzard led the most recent opposition to a bypass two decades ago, before she became an aide to U.S. Rep. Earl Blumenauer. She has since retired. Even if a county plan calls only for a study, Blizzard said, "It is a significant policy statement," because any new major arterial is likely to affect land zoned for farming and rural reserves that are off-limits to development for 50 years. Blizzard also sat on the advisory committee for the 2017 transportation futures study — and she said she disagreed with its conclusion. "Increasing westside capacity is not one of the better choices in that study," she said. "I am not convinced it would be a wise investment." Written opposition came from Mary Manseau, a former planning commissioner, and Mary Kyle McCurdy, deputy director of 1000 Friends of Oregon, a statewide land use watchdog group. "I don't know if it will ever get done, quite frankly," said Anthony Mills, a planning commissioner. But Mills cast his vote with the majority after he described opponents as "anti-growth activists." He said a public opinion survey conducted as part of the 2017 study indicates support for both potential highways. The survey quizzed 400 people, age 18 and older, by telephone in January 2017. Its margin of error is 5 percentage points. For a new route linking the Sunset Highway near Hillsboro to I-5, 68 percent of those sampled strongly or somewhat favored it; 23 percent opposed it. For a new route linking the Sunset Highway to U.S. 30, 60 percent strongly or somewhat favor it; 24 percent opposed it. "I am reading this to say that the public does want us to address this issue," Mills said. "We are not talking about a line on a map," said planning commissioner Matt Wellner. "That is when people really get fired up." "It's time we talk about it," said planning commissioner Ed Bartholemy. "We need some balance. With all this talk of multimodal, I don't see cars going away." But the survey also offered some support for opponents of new highways. In the survey, 48 percent of those sampled said they would support paying $300 more per year for transportation improvements; 59 percent at $200 more per year, and 74 percent at $100 per year. It also indicated that the youngest generation — now ages 18 to 35, but will be the dominant population group by 2060 — is the least likely to support highway improvements (50 percent) and the most likely to support public transportation (74 percent). Tegan Enroe, a planning commissioner, said the two matters should not be intertwined. Enroe was joined by Ian Beaty and Deborah Lockwood in opposition. "It is something that warrants additional discussion. It's a large concept that people have opinions on," Enroe said. "But coupling it into this ordinance creates a lot of complications." Two planning commissioners were absent. Eric Urstadt announced in favor of the highway study; Jeff Petrillo opposed it. The two finalists in the Nov. 6 election who seek to lead the Washington County board have opposing views on the concept of a westside bypass highway. County Commissioner Bob Terry, who ran second in the May 15 primary, says he is for a north-south primary route — although not in one swoop. "We talk about congestion relief, but we don't want to bite the big bullet of congestion relief," he said. "A westside bypass does make sense. It does not mean you have to do the whole thing all at one time." Terry said he favors some way to relieve congestion on the Sunset Highway (U.S. 26) that skirts the northern parts of Beaverton and Hillsboro. That would mean a connection with U.S. 30 — and possibly a linkage with Interstate 5 — to allow trucks to bypass downtown Portland. A second highway would connect Hillsboro with I-5 and I-205 — possibly at Wilsonville, or farther south. Terry acknowledged that the second route would offer little relief from traffic congestion on Highway 217, which links I-5 with the Sunset Highway. Metro Councilor Kathryn Harrington, who ran first in the four-way primary, says either project would divert money from others already on the drawing boards — and remains just a concept. "We would just take something drawn on a map that has not gone through any corridor planning at all, and does not show up on anybody's transportation plan, because it hasn't gotten through the planning that is necessary," she said. "The reason (for opposition) is that we have more urgent needs." Terry and Harrington responded to a question posed about traffic congestion at a candidate forum March 1 at the Broadway Rose Theatre in Tigard.